Ah, this makes me so sad. I am in the middle of an international move. We just emptied our house yesterday. A third of our stuff went into storage, another third went in a container that will be shipped to Beijing where we are moving and the last third is coming with us. We have a lot of suitcases because we need to live three months without our shipment. Unfortunately, there wasn’t enough room in our car to bring all of our suitcases from our house to my mother’s where we’ll be staying for the next two weeks. And one of the suitcases left behind has all my art supplies including the ones I use for my 52 Pick-Up project. Poop. This project brings me so much joy, I’m bummed that I have to wait until Tuesday to make my card. Moving is rough guys. Still, let me share these other cards with you. After a long hiatus, I have gone back to my tarot practice in the last three years. I take a moment to consult these cards when I feel I am in turmoil and need some direction. They always are generous and give me much to meditate on; they also give me something to focus on to grow and centre myself. 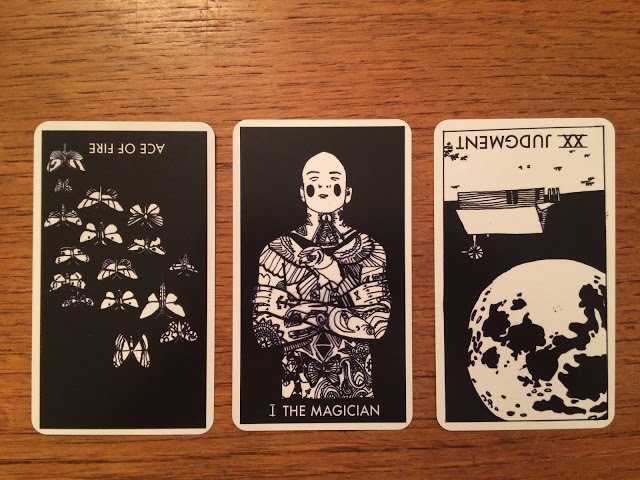 I definitely needed some of this the other night so I pulled these three cards. This is a Mind / Body / Spirit spread and I used The Nomad Tarot. Interestingly enough, I usually never do the reversed card thing. I need the positive that these cards bring, not the negative so I usually turn them back up. But this time I was so curious because I had two that were reversed. And, oh my!, message received loud and clear. The Ace of Fire is usually and indicator that we have lots of energy and optimism and that it is a good time to use that enthusiasm to start something new. But, because it is reversed, the positive energy from this card is undermined by a lack of focus or by forces out of our control. Things fall apart and our energy overwhelms us or the people around us. Just look at the card, all those fluttering butterflies. Now this, this is me these recent weeks. Because our things were going in three different places and because we cannot pack anything (for insurance purposes the moving company has to pack and inventory everything), I have felt completely mentally blocked. It has taken me so much energy to sort things but not complete the cycle. I love to set myself to a task and check it off. For a move, I would go room by room and make boxes, all of it nice and organised and done. But because I couldn’t do this, there were only piles and piles of stuff. Nothing getting cleared, everything just pulled out and staying put. It really made it hard for me to focus on what needed to be done because I felt like nothing was getting done! This is one of my favourite cards because it basically says that it is all in you. The Magician (you) has all the power of creation and transformation in him. Through willpower and determination goals can be achieved, all the energy is there but you need to tap into it and use it. My body has been completely and utterly neglected these past two years in Canada. Between working full time and my art practice, I have not done any exercising at all. And it shows. It shows in the weight gain but also in loss of energy and a generalized ‘run down’ feeling in my body. I am looking forward to two things concerning my body in Beijing: 1- having the time to get back in shape and 2-walking places. Where we lived in Gatineau (Canada) was just awful. There was nowhere to go if you don’t have a car. In Hong Kong, in Montreal, I would walk everywhere. I love walking and that was something truly missing from my life in that house. I also need to watch what I eat and give myself proper fuel. This card is part of the Major Arcana (as is the Magician) and as such is a card that must be meditated upon. Judgement is usually a card of rebirth, changes and clean slates. But the fact that it is reversed indicates someone who doesn’t want to answer the call of change for fear of the unknown. But the reality has already begun to shift so the only path is forward. No more excuses for refusing to follow, it will happen anyway. I was floored by this one. This is exactly what I’ve been doing concerning this move. Transitions are very hard for me. I had to leave a job that I was so extremely passionate about, that suited me and I it, it was my dream job and I had it and I had to let it go. That is so difficult. I still cannot. I am still mad about that. I identify with being an archaeologist, I feel at a complete loss without it, I am frustrated. This is what happened to me when we were posted in Hong Kong and I became ‘wife of’. But there is nothing to do but move forward because this move to Beijing is what is happening anyway. In the end, I found a new identity in Hong Kong and made it through. Like for the first card, I am not dealing completely with things. They are simmering and I am just trying to get through this very intense period. Once I get to Beijing, I will process. I will have a lot of that to do. My saving grace will be my art practice. It is how I identify myself when I am abroad: as an artist, as a creative. I know that in the end I will be ok, I am resilient and have both these versions of me – the scientist and the artist- within. But this passage from one state to the other? Brutal.